I do too. Yeap. My mother makes the best gemista in the world, and before her, it was my grandmother, who held the title of the master of my comfort food universe. Gemista, that means stuffed in Greek; a variation of vegetables stuffed with rice or meat, common in the Balkans and Eastern Mediterranean. 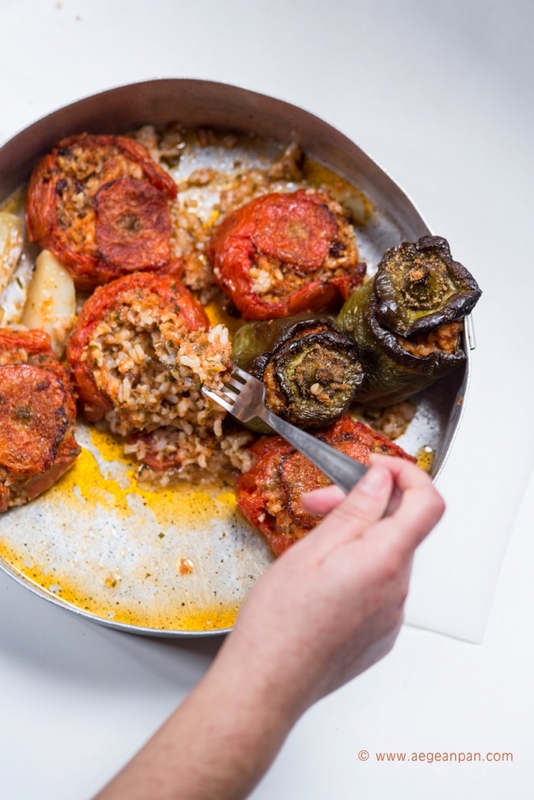 My mother made the gemista that you see in the photographs: oven baked tomatoes and green peppers stuffed with rice – it’s my favorite version of the plate. She puts raisins inside the stuffing, which I love, but my sister hates them, so she makes two different kinds of stuffing and puts toothpicks on the vegetables that don’ t have raisins to separate them (yes, I know, my mom is great:)Another thing that she does, is to sprinkle the top of the vegetables with dried breadcrumbs so that everyone can have a crunchy first bite… It’s an easy recipe to make; the secret is to use vegetables that are in season and to keep the stuffing juicy. Make sure that you have some good quality feta cheese or yogurt to accompany the plate and give it a try. Happy Mother’ s Day! Clean the potatoes and slice them into big pieces. Slice-off the top of tomatoes and peppers (keep the tops that you have cut off); use a spoon to remove their flesh without tearing the skin. Remove the pepper seeds. Sprinkle the sugar inside the tomatoes. Put the vegetables upside down on a baking pan to drain and prepare the stuffing. • Put the flesh of the tomatoes and peppers in a pan. Add the onions, parsley half a cup of olive oil, salt, pepper, and bring to boil. • Remove from the fire and add the rice, raisins and spearmint. Stir well. • Arrange the tomatoes and peppers on the baking pan fill them with the stuffing. Put the potatoes between them. Close the vegetables by replacing the tops that you have cut off. Sprinkle the vegetables with a little olive oil and the tops with dry breadcrumbs. • Bake in a pre-heated oven at 230 o C for about 80 minutes. * Gemista are eaten warm, or cold as well; it is a food that tastes even better on the next day. This post is dedicated to my friend Rebecca, who became a mother for the first time this week.